After more than a year, Miss Q and A has finally found the top 10 wittiest and smartest queens from the LGBT community. Vice Ganda then announced that every candidate will have a respective judge to ask them a question. For Kristine, she was asked by Pokwang on how will she convince the people who mistaken her as a transgender? She answered that homosexuals emulate women and she believes that Pokwang is a good person. Khei is the next one to be called and her question was asked by JM De Guzman if her parents will allow her to be with him 24/7? She replied that she is now on a legal age and if they are together, they will create good memories. Rianne is the 3rd contender and Brandon Vera asked her if she is willing to have a MMA fight with him? She responded that she will accept the challenge even though the result is obviously not in her favor. Odessa is then called and was asked by Paul Cabral on what she will choose between North and South to add on his name? She stated that she will select North because she believes that he is a decent person. For Matmat, Catriona Grey asked her if she is going to have a competitor from another planet in upcoming Miss Universe. She said that if the organizers will allow it, it may be possible because being Miss Universe possesses self-confidence. For the 6th contestant, Marigona was asked by Nicole Cordoves if she will hold on her big earrings. She answered that she won’t do it because she doesn’t want to hurt her. Lars is the next one to be called and her question is from Karylle who asked her if she did not end up with Yael of Spongecola, will it be possible with Spongebob? She said that what’s for you will always be for you because God will have someone for you. For Elsa, she was asked by Korina Sanchez on why Rated K is not included on the classification ratings? She replied that it shows the beautiful places in the country so, it doesn’t need to be a part of it. Princess is called and her question is from Boy Abunda who asked if you are going to have a fasting before a fast talk? She stated that you don’t have to do it because what’s important is, you know what you are saying. Last but not the least is Juliana who was asked by Jugs and Teddy if you are going to use a steady rock if you will see an itchy worm? She replied that in life, we should stop being careless and give up if things doesn’t go to the way we want it. For the 2nd round, the 6 remaining contenders were paired to debate about a respective topic. The 1st pair is between Rianne and Matmat who talked about which is better to apply a makeup between an alive person and dead. The next pair is Elsa vs. Juliana who debate about what is more bad trip to falter in sneeze and yawn. The last pair is Lars and Marigona that battled it out on who is braver, Cardo of Ang Probinsyano or Lakas of bagani? After a deliberation, the top 3 are chosen and they are Matmat, Juliana and Lars. The 3 remaining contenders are going to answer the question that says, what is the most difficult question and why? Matmat said on why most people in the community still can’t accept the members of the LGBT because they just want to be treated fairly by the society. For Juliana, the hardest question for her is on what her biggest fear is because her response for that is if she will lose her mother. Lars is the last one to give her answer and she stated that the hardest question for her is why is she acting like that but she believes that she doesn’t need to pretend for she is happy for what she is. 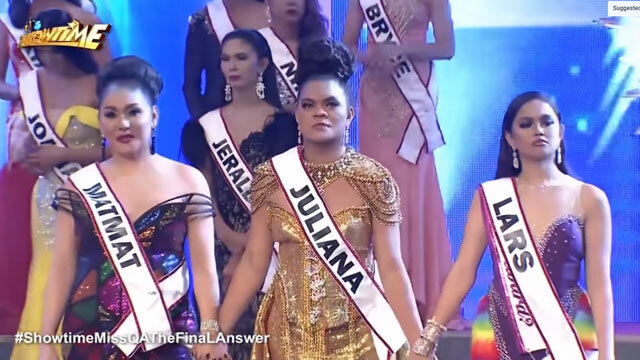 Based on their answers, the judges chose Lars as a 2nd runner-up, Matmat took 1st runner-up while Juliana is crowned as the 1st ever Miss Q and A.